Lock in a great price for Mobile Homes Polari – rated 8.4 by recent guests! I loved our Mobile Home, it was very clean and comfortable. I liked the pool next to the house and beautiful beaches. The receptionist was nice and very helpful when my son had an accident. 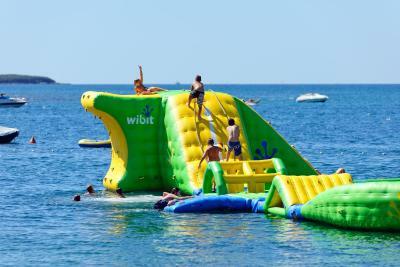 If you're going on vacation with kids this is a perfect place. They have everything for kids. The environment is beautiful, the staff is very kind, kids really liked it, we could obtain/buy everything that we needed in the camp. Very nice location, it offers several restaurants, nice beaches and pools, fresh bakery, fruits and vegetables in location. Mobile homes were clean, swimming pool as well. Pool were cleaned every day. Clean towels were included at the beginning of the stay. Staff was pleasant. 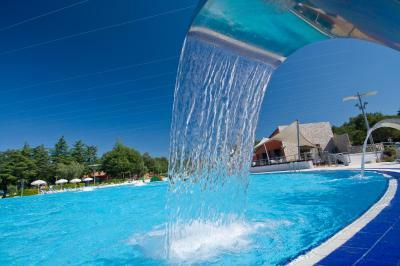 Many attractions, great location, very nice swimming pool complex. This park had it all, beautiful setting, plenty for the kids to do, and relaxation. 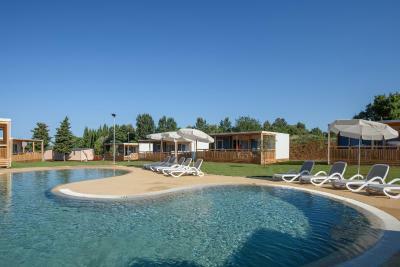 Very comfortable, child friendly environment, amazing scenery and overall an enjoyable holiday for the whole family. Wil definitely return. It's a third time we were around Rovinj, in another campsite. Polari is one of the biggest (if not the biggest one) and it shows and impacts the way you move around. 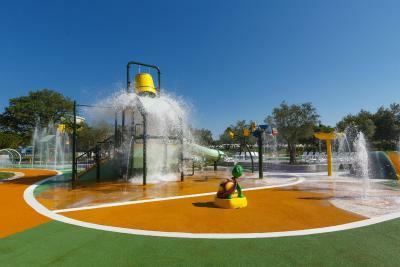 There are a lot of facilities and playgrouds to go around. 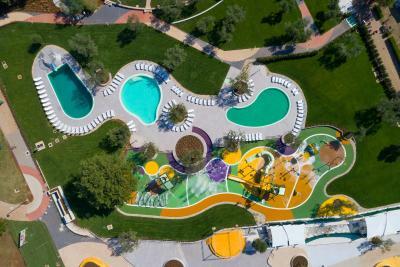 Pools are in many places with the biggest one in the central location. 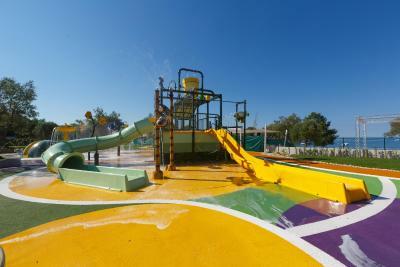 The water playground with smaller pools was a massive hit and most interesting thing for our kids. 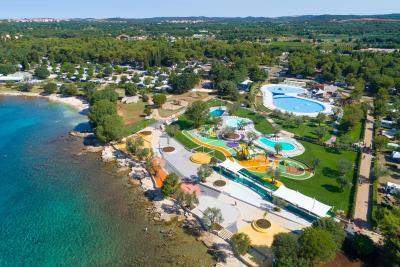 Camping houses were very clean and accomodable for a family of 4, and a jacuzzi was a really a joy (again- kids loved it), thanks to the staff at Maistra we had three houses (from different bookings) next to each other, at our request. There's a great restaurant just next to the entrance of the campsite. Mobile Homes Polari This rating is a reflection of how the property compares to the industry standard when it comes to price, facilities and services available. It's based on a self-evaluation by the property. Use this rating to help choose your stay! 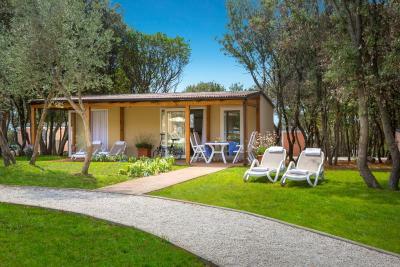 One of our top picks in Rovinj.Mobile Homes Polari is in a picturesque cove, 2 miles south of Rovinj. It offers just over 1 miles of beaches filled with all kinds of recreational facilities for an active holiday. All mobile homes feature air conditioning, a furnished terrace, deck chairs and a flat-screen satellite TV. It offers a full kitchen with a dining area and 2 bathrooms. 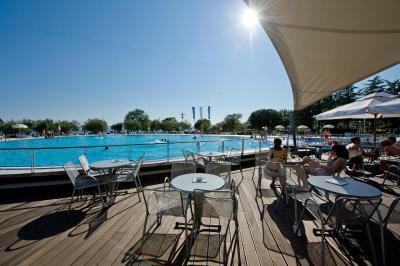 Facilities include a large swimming pool and a children’s pool, restaurants, bars and a beach awarded with a Blue Flag. Other activities include tennis, beach volleyball, basketball, handball and ping-pong. 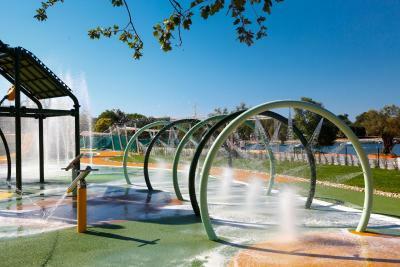 Polari also offers a children’s playground, mini club and rich entertainment program. The ancient city of Pula is 22 miles away. It is known for its amphitheater which is one of the six largest surviving Roman arenas in the world. 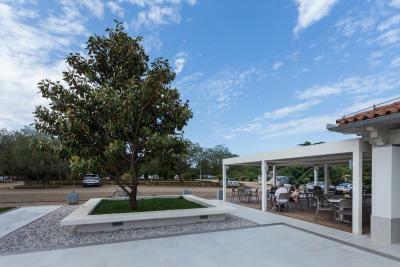 Pula International Airport is 24 miles from the Polari Mobile Homes. When would you like to stay at Mobile Homes Polari? 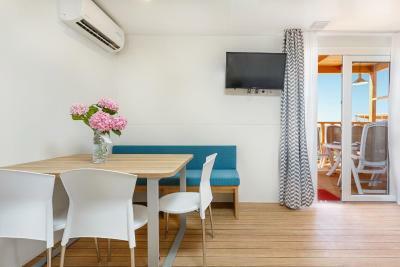 This air-conditioned mobile home features a furnished terrace with a hot tub, deck chairs and a flat-screen satellite TV. It offers a fully equipped kitchen with a dining area and 2 bathrooms. The 2 bedrooms can accommodate 4 people, and the living room has a sofa bed for 2 children. Bed linen and towels are included. Please note that pets are not allowed in this unit. 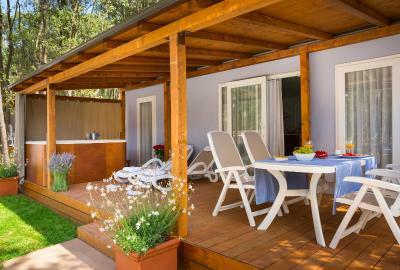 This air-conditioned mobile home features a patio with sitting area and deck chairs. It has a full kitchen with a dining area, flat-screen satellite TV and 2 bathrooms with a shower. Bed linens and towels are included. 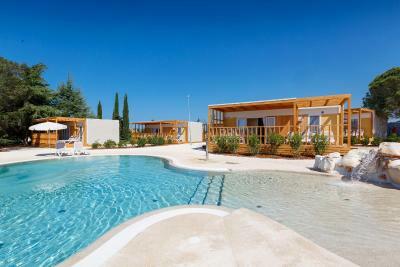 Guests have access to a shared swimming pool. Some pets are allowed in this unit type upon previous request. The mobile home is air conditioned and features a patio with outdoor furniture. The living area consists of a flat-screen satellite TV and a sofa bed. A fully equipped kitchen with a dining area is also featured. There are 2 bathrooms equipped with a shower. The mobile home consists of 3 bedrooms, fitted with a double bed, two bunk beds and a pull-out bed. 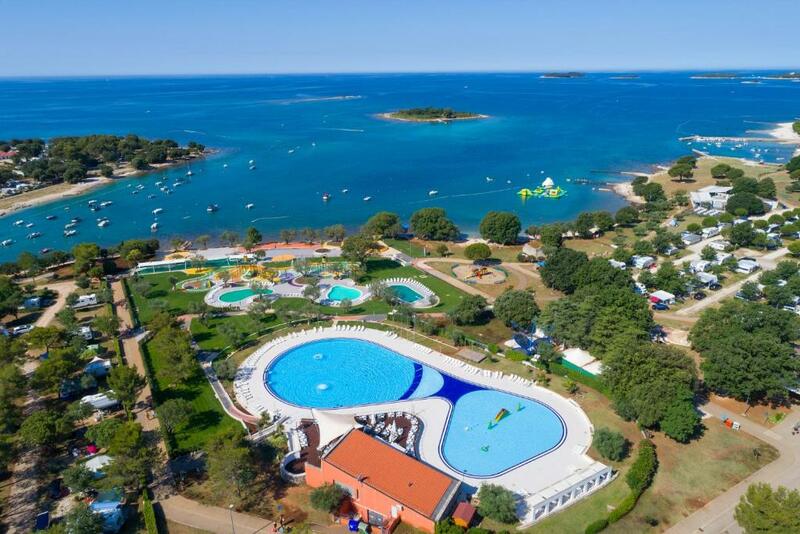 Campsite Polari lies on two kilometres of beautiful beaches garnished with all kinds of recreational facilities for an active holiday. Enjoy the peace and comfort of a fully equipped mobile house. House Rules Mobile Homes Polari takes special requests – add in the next step! Mobile Homes Polari accepts these cards and reserves the right to temporarily hold an amount prior to arrival. When booking more than 3 mobile homes, different policies and additional supplements may apply. Number and position of the mobile home will be assigned to guests on the day of arrival. Please note that outdoor swimming pool and children's playground with sprinklers are available from 20 May 2018. We reserved mobile home with jacuzzi. We were rebooked to ordinary mobile home, because of the dog. We had to pay the same price as for mobile home with jacuzzi, and when we were walking aroud, we saw dogs staying at mobile homes with jacuzzi. We reported it to front desk, but they only said they were not informed about that. Very dissapoonting. I did not like very cold water in the pools and high prices of food . Very clean and comfortable mobile house. There is two bedrooms with two bathrooms, kitchen, dining area with TV, and very big terrace with outside jacuzzi. Free pool outside at front of house and free entrance pool area in village. Our mobile home was next to a busy entrance to the resort, so noisy. Great facilities! Beautiful coast and sea! WI-FI was sooo bad, fortunately we brought our 4g router. If you need any assistance in making it a real service please let me know, I might know couple of people that could do that job properly. Or just shut it down because it's useless as-is. Mobile homes are a little bit to small but yet enough space for everything. 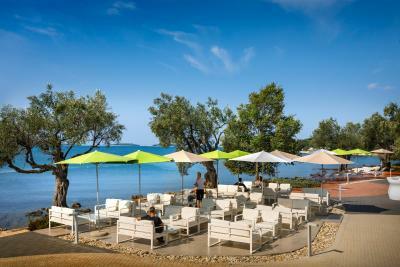 The prices in camp are really to huge even for Croatia so beter to do some shopping foor food and drinks in local stores. Too expencive, not worth it. nothing not to like about it. 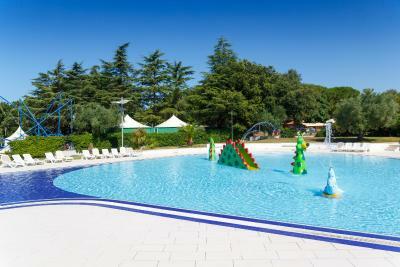 the location is amazing, it has all the facilities you'd ever need, an excellent choice for children.